The results tree provides overall statistics for each container or request in the form of a tree. Several metrics are available, please report to the Hit Metrics Availability tree. When displaying statistics for HTTP requests, you may have two rows for each request if you selected Download Resources in your Virtual User. To customize a specific column, please refer to the documentation page about the legend and metrics. 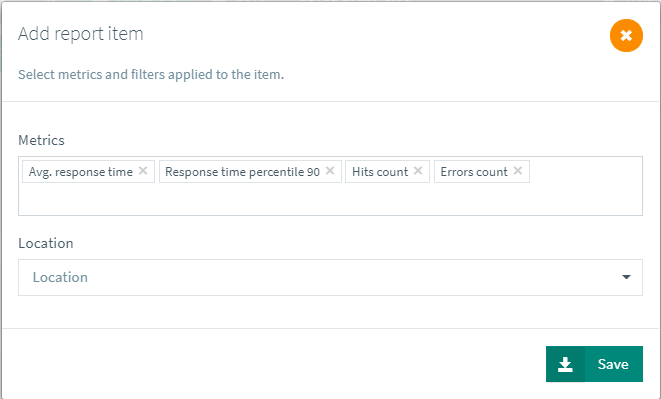 The Metrics input lets you select which metrics are displayed (one column for each metric). Click on the Save button to apply the modifications or on the Close button to keep the original report item (it is still inserted but your modifications are not applied). Once the tree is inserted, you have to edit each column one by one, so it may be quicker to insert a new tree and remove the old one if you want to apply filters on every metric/column.